We have decided to move our blog to a new home – onto the same platform that we use for our lab portal. The main reason for doing this is so that we have more flexibility around being able to embed objects, such as interactive maps and charts. It will also consolidate our analytics – so that we can better understand how people are using our site. We will keep this WordPress site live, but not add any new content. All content from this blog will be ported over to the new site when we get chance. 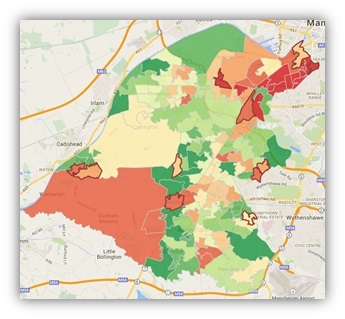 A request was made to the lab to provide some data to support research into appropriate areas of Trafford to focus on reaching vulnerable residents who are most likely to benefit from additional services and advice made available from the ‘Warm Homes, Healthy People’ project. The priority of the project is to ensure that the needs of Trafford’s most vulnerable residents are met, both physically by keeping them warm and fed over the winter months but also to avoid isolation by encouraging emotional support and wellbeing. In order to formulate a strategy we must first identify small areas for concentrated attention, ideally specific streets or estates. We have two main datasets available to support the initial investigations, firstly the geographical data provided nationally by the Office for National Statistics (ONS) on households classified as fuel poor and secondly a dataset provided by Trafford Assist on the number of applications made to the council for support with gas and electric payments. Ideally it would be preferable to include local data on excess winter deaths but unfortunately this data is not currently available to us at the point of writing this blog. The coefficient for calculating fuel poverty has recently been refined in an attempt to improve its accuracy, with a drawback that we only have data coving periods 2011 and 2012 with which to draw conclusions. For definitions of the fuel poverty coefficient please visit here. I extracted and updated the fuel poverty indicators and added them to the InfoTrafford server. I was then able to produce an interactive report which geographically maps the data and allows for correlation analysis between 2011/12 and also other available datasets. I mapped to a variety of geographical layers including borough wide, political ward boundaries, middle layer super output areas (MSOAs) and lower layer super output areas (LSOAs) and was also able to aggregate ward level data to fit with our own Trafford Locality boundaries. When looking at ward and locality level data it’s clear that there are significant differences in the proportion of households classified as fuel poor between the North and South of Trafford with the highest density around Clifford and Longford Wards. For the purposes of identifying smaller areas I began to look at the LSOA geography, which for the most part supports the findings of the wider areas. There are LSOAs within Clifford and Longford that have a notably lower proportion of fuel poor than their neighbours which is affecting the overall rate of the ward. It is also worthwhile looking at the rate changes over time; albeit only for the two years we have available to us. 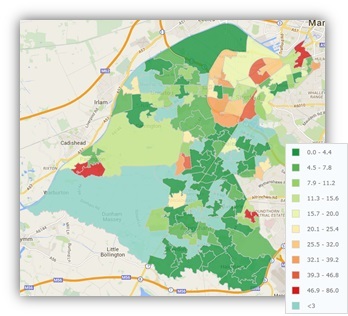 It seems the areas with statistically significant increases align to what we know are the areas where deprivation is prevalent in Trafford, including LSOAs in Partington, Sale West, Sale, Broadheath and Broomwood. Trafford Assist provide emergency help in the form of food, furniture and energy bills for Trafford residents who are struggling to meet their basic needs to remain healthy. Any household are permitted to request emergency assistance to a maximum of two applications a year, with a provisional additional allowance of one claim between November and February. The following map shows the number of claimants for the purposes of assistance with energy bills during 2013 financial year. Small numbers have been supressed. 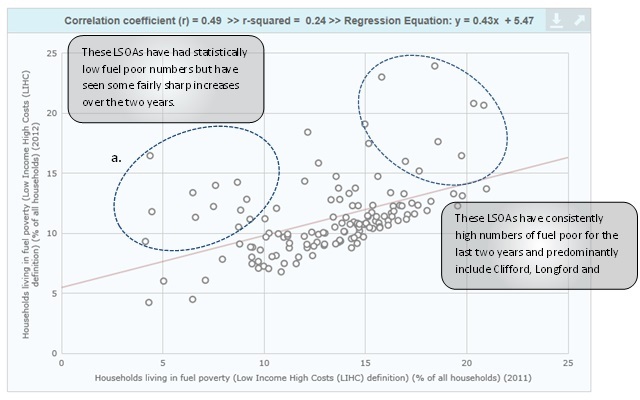 There are large areas of Clifford, Longford and Stretford which have consistently high numbers of fuel poor households, though some of Trafford’s more deprived areas outside of these areas have also seen notable increase since 2011 though it would be unwise to build trends base on just two years of data. With each year’s addition it may be possible to build these trends. Those areas with higher numbers of households actively seeking assistance do not align entirely with the story told by the fuel poverty indicators, particularly in the Clifford areas where there are very low numbers of emergency help applications for the number of fuel poor households. Instead the higher number of claimants are around deprived areas where we are seeing a rise in fuel poverty including Partington, Sale West, Broomwood and Stretford. The Warm Homes, Healthy People project have decided to adopt an borough-wide approach by focussing on the highlighted areas of high fuel poverty as well as pinpointing other areas throughout the borough where early escalating trends could be improved. From Superheroes to Leisure Centres – #notinventedhere! 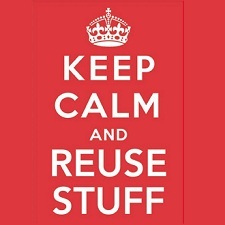 Yet ANOTHER variation on the Keep Calm trope. I had even looked at examples of chord diagrams before – but decided that they weren’t particularly good at communicating information (Wrong!). So we had a look at the Superhero visualisation – which shows superheroes on one side, and superpowers on the other. The interactive visualisation allows you to select either a power, which shows which heroes have that power, or the superhero, and which powers they have. What was interesting about it was that it communicated a lot of information, in quite a small space. One thing that jumped out at us (not all of us, I have to confess – comics aren’t my thing), was that Spiderman had ‘Substance Secretion’ as one of his powers. Well -hell hath no fury like a nerd who has spotted an error. According to the team, Spiderman does not ‘secrete’ his webs. Rather, he developed canisters that spray some sort of polymer. In order to check the accuracy of the information, then, we decided to go to the closest thing we have to an expert – Mark the librarian. Mark runs the cult film club at Stretford Library (he also does the Friday morning rhyme-time, but that is largely irrelevant). Mark suggested that actually, in the film, spiderman did develop the ability to shoot organic webs from his wrists. Something to do with being bitten by a queen. Mark (and the team) spent a bit of time on the visualisation, looking at different heroes and traits. Mark was particularly outraged that Spiderman did not have intelligence – Spiderman apparently being a genius on a par with Batman or Daredevil. There were also discussions around Wolverine’s apparent stealth ability, Superman’s intelligence (disgraceful…), and Captain America’s physical perfection. The point of all this is that there is a LOT of information here, presented in a way that is engaging, easy to access, and easy to understand. It sparked discussion, and that is what we are trying to do. So I decided that we would nick it. We let Mark leave, and had a chat in the lab about how we might make something that might be useful for people in Trafford. What datasets could work in the same way? We had a look at education data – attainment in Key Stage 2 (age 11) by different demographic factors. We grabbed the code from Mike Bostock’s Uber dataviz, and modified it, recreating it with this data. It didn’t take long to reproduce, at all (an hour..? ), but when we looked at the visualisation – it was more confusing than anything else. We changed it slightly, so that the thickness of the line indicated what proportion of a particular demographic group (boys, white british, etc), achieved each level in the tests. It seemed to take a very long time, as users, to decode the information, so we abandoned it (didn’t even take a screengrab, annoyingly). We then had a bit more of a chat about what might work – and decided that a diagram of physical assets along with the services that they provide would be useful, and it would look good. We decided then, to look at sports facilities across Trafford – Leisure centres, municipal golf courses and athletics stadia. 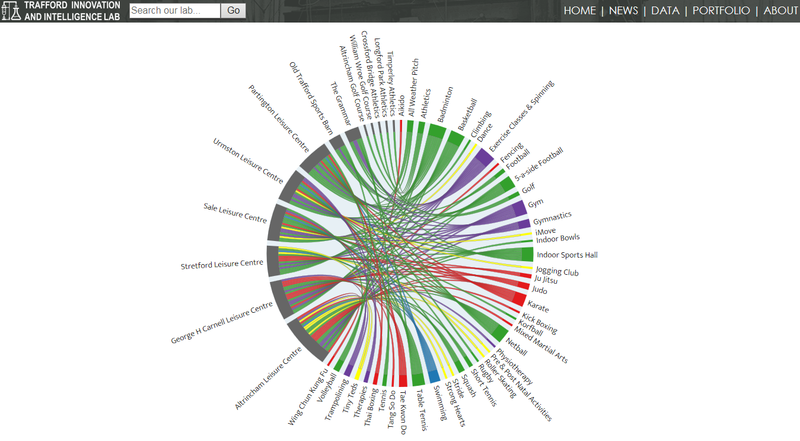 We pulled the data off Trafford Community Leisure Trust’s website, and put it into the matrix. It is really very easy to see what activities are available in Trafford, and where you can do them. It’s also useful to see what activities each centre accommodates. As an example, if Indoor Bowls is your thing, Altrincham Leisure Centres where it’s at for you. We are really pleased with how it turned out, and we’ve now had requests from a couple of other teams to do similar visualisations with their data – from health service providers, to a strategy mapping viz..
Feel free to pull the code apart, and repurpose it for your own projects. Contact us if you need a hand. I am verrry grateful to Mark Barrett and Hebeworks for the original inspiration. And Mike Bostock for creating D3..! I am currently helping to organise an event called ‘Open Data Camp’, which is to be held in Winchester (it’s near Southampton), on the 21st and 22nd February 2015. We think that it’s definitely the first of its kind in the UK, and possibly the first in the world (or even the universe, depending on which side of the Drake Equation fence you sit on). The 21st of February also happens to be International Open Data day. Open Data Camp is a two-day event, consisting of an unconference and maker-space. The focus of the event is entirely open data – the notion of making data available so that it can be reused by anyone, without any restrictions. Though the event is an unconference (which means the content of the day is decided by attendees at the beginning of the day), it is likely that there will be sessions looking at the National Information Infrastructure, technical challenges, and opportunities presented by open data, amongst lots of other things. We are a group of people who are passionate about open data. We really feel that by opening data up, good things happen. There are many events held where open data is a supporting cast member – but at Open Data Camp – it’s the star of the show. To bring together 200 people for a weekend who are into open data is a brilliant opportunity to push open data forward. Why are Trafford doing this? Trafford has a history of doing open data well. We worked on setting up DataGM, we were the first Local Authority to be awarded a Pilot Level Open Data Institute Certificate, and we have recently been asked to work with the Cabinet Office as Local Experts in Open Data – working with a handful of other Councils who also do it well. We use open data, as well as releasing it. We have recently used open data to identify priority sites for positioning defibrillators, apply for funding to support projects to reduce isolation in the elderly, and combined open and closed datasets to analyse cervical cancer screening rates, amongst many others. Because of this, we have a vested interest in the wider open data picture. The more open data is released, the more we can use it to provide intelligence – through analysis and benchmarking. The better our intelligence is – the more informed our decision-making is. But apart from the benefits that more data brings, there’s another good thing that’s happening because of the camp. The open data community is exceptionally talented, but is quite thinly distributed across the globe. Open Data Camp is being used as a touch point for some of these groups and organisations – the camp itself is now looking likely to connect with the Open Knowledge Foundation hack in London, Bath:Hacked, Greater Manchester Data Synchronisation Programme Lean Startup weekend, Ebola Open Data Jam, and ODI nodes. The mechanics of these link-ups are yet to be worked out, but the fact that these connections are forming is very good for the open data movement. All the tickets for Open Data Camp have now been sold (or rather allocated – it’s a free event). I will blog about the event once it has happened, with outcomes, outputs, challenges, etc. We (the campmakers will be tweeting in the run up to the event, and during the event itself, using the hashtag #ODcamp. All campers will also be asked to tweet during the event. We are also looking into ways that we can livestream sessions – more details of that will be available on the website. Finally – if the camp is a success, we’ll probably look to make it an annual feature. If so I’ll do my best to drag the next one up North. Don’t be afraid to get tickets and come along! One of the many roles that we undertake in the Lab is to support the National Child Measurement Programme in Trafford. I have written about this before. Despite us having access to all the raw data associated with the Programme in Trafford, we decided to only use data that is published through the Health and Social Care Information Centre website. Doing this ensures anyone could recreate the Infographic for another geographical area, if they wanted to. We used Microsoft Excel to draw the charts, and Microsoft PowerPoint to create the Infographic. This feels like a good way to create simple, static Infographics, without the need for Photoshop/Illustrator skills. The only issue that we had was in exporting the slide as an image – the default resolution is not high enough to make small text legible, at 96dpi. This was soon fixed, by editing the registry, upping it to 200dpi, which made everything a lot clearer, whilst increasing the size of the .png file from ~100kb to a still-manageable 600kb. The whole process took around 4 hours, from start to finish. Feedback has so far been very positive – with this style of presentation being much more engaging than traditional reports. Next steps for us are to develop the maps further – adding schools etc. We will also be making an online, version of the infographic – less print-ready, but slightly interactive, using Leaflet and Highcharts. As always, feel free to distribute or reuse. And if you have any comments or questions – we’d love to hear them. Last week, Phil Swan of iNetwork led a breakout session at an ‘Improvement and Efficiency West Midlands’ conference at the ICC in Birmingham. In his talk, he very kindly spoke about our Innovation and Intelligence Lab in Trafford, and demonstrated a couple of things that we’ve done to use data to support decision making. One of the things he showed was our defibrillator map (albeit an old version). Defibrillators in Trafford as at 6 November 2014. I’ve written about how this came about previously, so I’m not going to dwell on that. What was interesting, though, was that Andy Mabbett, who was tweeting the conference on behalf of IEWM, pointed out that the data should be on OpenStreetMap. OpenStreetMap (OSM) is a massive open map of the world with all sorts of things mapped onto it – streets, places of interest, cycle routes. Anyone can edit it, and it’s a very rich source of data. We have added a couple of dog poo bins to OSM in the past, but just as a test. I felt that putting defibs onto OSM would be an excellent plan – we could add all the points, and then use that OSM data in our own reports. The dataset is also much more open, because it can be added to other areas’ defibrillator data (maybe ultimately giving a WORLDWIDE map of defibrillators..!). It also means we could get people to add defibs that they know of straight to the map – more crowdmapping. Andy also provided a link to the OSM wiki, showing how to add defibrillators. They are essentially created as points of interest with a key:value pairing of ’emergency:defibrillator’. To add the defibrillators, then, I logged into open streetmap, zoomed to Trafford, and went to edit. I use Potlatch 2 to edit the map, which runs from within the browser window, but does require Flash. There doesn’t appear to be a facility in OSM to bulk upload data (at least one that I could work out), so I had to add them manually. To add the defibrillators, I zoomed to the appropriate building on the map, and dragged in any icon from the window on the left. It doesn’t matter which – defibrillators aren’t in the window, so I changed them manually. A new icon is then added to the map. Clicking this icon changes the left panel to a simple information screen. By clicking ‘advanced’ in the bottom-left corner the key:value pairs are displayed. I added a new one, with emergency in the left column, and defibrillator in the right column. This tells OSM that the object is of type defibrillator in the collection emergency. I then deleted the top row, which relates to the icon that was used to create the marker. Saving then adds the entry to the database. 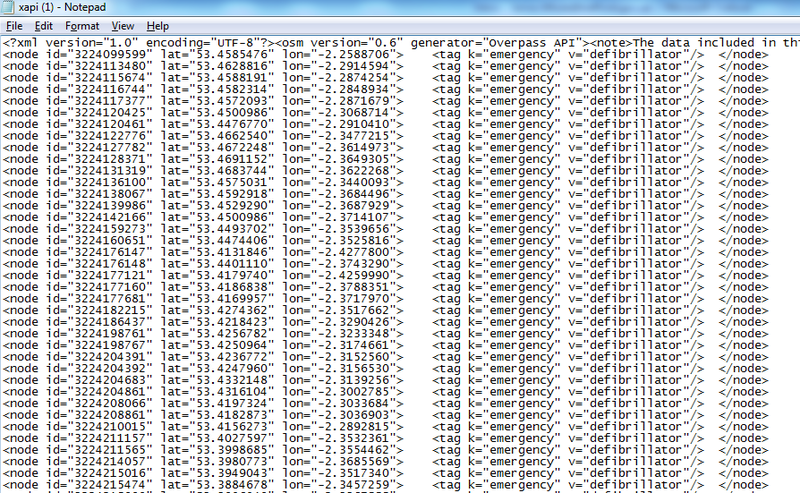 To check that the defibs had been added successfully, I used Harry Wood’s XAPI query builder. By putting ’emergency=defibrillator’ in the search by tag field, and zooming to Trafford and drawing a box around it, I could run the Overpass API to view an XML file containing all the defibrillators in Trafford. XML file of defibs in Trafford. I have two further things that I’d like to do with this. There are additional data items that can be associated with the defibs – accessibility, description of location, restrictions on use, that would be very useful to add. We need to work out how we can query OSM using the Overpass API, and display our own defibrillators on our own reports. Once we’ve done this – we’ll add a new blog post detailing how we did it, and what the outcome is. We’ll also look into putting other georeferenced datasets onto OpenStreetMap. We aren’t allowed to add anything that has been derived using Ordnance Survey products such as Mastermap, but anything that we can get up there, we will. As always – if we’ve approached this in a horrible way, please let us know. If you can use the data, or make something nice out of it – send it through and we’ll showcase it. The Lab has been launched for a couple of months, and I figured now is a good time to put down a little bit about what we’re doing, how we’re working and who’s involved. I’ll update this as often as necessary, and I’ll also use this to point people to when they want to know about the Lab. The Lab is essentially a multi-organisation, multi-discipline data lab. We are bringing together data and data/information specialists from the various organisations that work in Trafford, to work on particular problems, that we think data can help with. 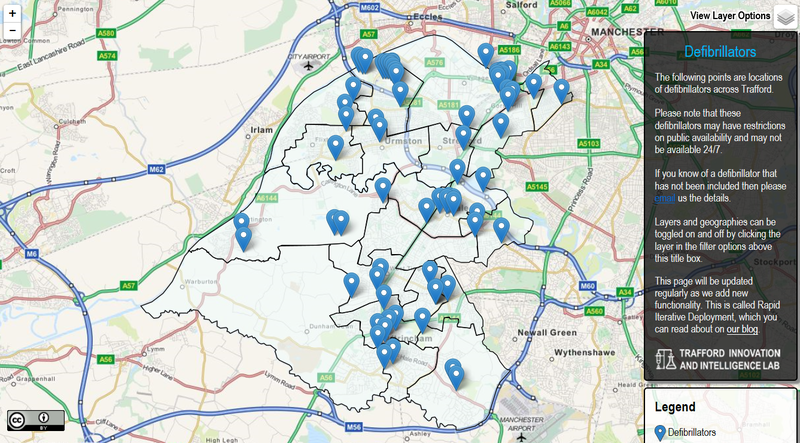 By combining datasets and co-locating people we’re pretty sure we can give a really good understanding of needs and opportunities in Trafford. As well as using open datasets, we will also be looking to release as much open data as possible. Cleansed data will be a by-product of the analyses, so making them available as open data will help to support future work, as well as provide evidence for decision making. Part of this is making sure that people understand the data and intelligence that we produce, so we want to work with organisations to support bids for funding, or research projects, for example. We are also looking at how we can use technology to improve the way we get, use and release data – things like sensors and web-technologies such as crowdfunding websites. How does the lab function? The lab’s workstyle is loosely based around agile – we are constantly talking to each other, and the people we do stuff for. We release things often, so that if there are problems, or a change in requirements, its picked up early on. We call this Rapid Iterative Deployment. Projects are managed using Trello, which we’ve found to be very flexible. We are trying to be open and transparent – blogging as we go along, and have active twitter accounts and facebook pages. Things that we develop are open source, and will shortly be available on GitHub. Sharing what we do increases its value enormously. We are currently thinking about how we can make our Trello board public, or at least a public view, so that anyone can look at what we are working on. Not everything we do has to fit into one of these areas, but it helps with the prioritisation of work. Most of what we do currently comes under Open Data or Open Knowledge. The lab was established by Trafford Council, with input from Trafford Housing Trust, the largest registered social landlord in Trafford. Initial funding was provided in part by the Cabinet Office. Profiles of all the staff involved in the lab will follow soon. We are currently based in Stretford Library (Bennet Street, Stretford, M32 8AP) in a room off the main library. We are looking to find somewhere a bit more flexible that we can use as a workspace and a hackspace, but that will come in time. Please feel free to get in touch..!